In what will come as a shock to probably nobody, The Emoji Movie has won the Worst Picture Award at the 2018 Razzie Awards. The T.J. Miller starring movie was destined for the award right from the start when it received an unprecedented zero percent on Rotten Tomatoes during its opening weekend. It has since climbed to a respectable six percent on the popular movie review aggregate website. In a statement, Razzies organizers branded the film a "talking poop opus," which is pretty much true except for the opus part. The Emoji Movie took home Worst Picture along with a few other honors at the 2018 Razzie Awards. Worst Onscreen Combo also went to the movie, but it wasn't specific and just said that it went to any two Emoji characters on the screen together at the same time. The Emoji Movie also took home the Worst Director Award, which went to Anthony (Tony) Leondis. Additionally, the movie even took home the Worst Screenplay Award, which went to Tony Leondis, Eric Siegel, and Mike White. 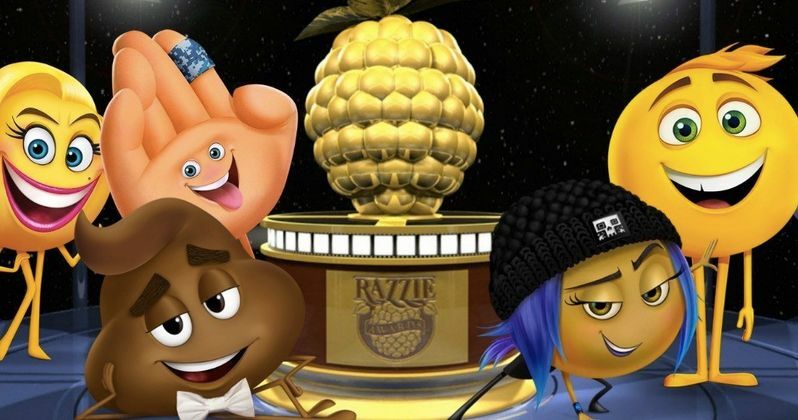 Basically, The Emoji Movie swept the 2018 Razzies. Tom Cruise was the lucky recipient of the Worst Actor prize for his work in The Mummy. The movie reportedly singlehandedly destroyed Universal's Dark Universe that they had planned. Rolling Stone reviewer Peter Travers famously remarked that Cruise should have played the Mummy in his review and others called the actor's performance "empty headed." For the Worst Supporting Actor, Mel Gibson won for his universally panned work in Daddy's Home 2, which was also in the running for Worst Picture of 2017. Tyler Perry won the Worst Actress Award, dressed as an elderly woman in Boo 2: A Medea Halloween and was nominated for the same award last year. Worst Supporting Actress went to Kim Basinger for her role in Fifty Shades Darker. Fifty Shades of Grey, the first installment in the trilogy, won a whopping four Razzies in 2016. The clear winner of this year is definitely The Emoji Movie, which is the project that got T.J. Miller thinking about leaving Silicon Valley to pursue his comedic dreams. It doesn't really look like things have panned out as well as Miller would have hoped with his first project after leaving the hit HBO show. The Razzie Awards, or the Golden Razzies, are the mock awards show that is typically held the day before the Academy Awards in a purposefully tacky event. Most winners do not attend the ceremony, but there have been some notable exceptions. Tom Green (Worst Actor/Worst Director), Halle Berry and Sandra Bullock (Worst Actress), Michael Ferris, J. D. Shapiro (Worst Screenplay), and Paul Verhoeven (Worst Director) have all shown up at the Razzies Ceremony. The Emoji Movie went in and swept the Razzies this year with a total of 4 awards, which is a pretty big achievement. Congratulations, Emoji Movie. You can check out the rest of the 2018 Razzie winners over at Entertainment Weekly.